The BareStone façade system from Cemintel® was specified for the new Western Sydney Stadium in Parramatta. Built to replace the previous 22,000-capacity Parramatta Stadium, the new stadium will provide undercover seating for 30,000 people. The $350 million project is due for completion this year. Designed by global firm Populous and built by Lendlease, the new stadium boasts Australia’s steepest stands to ensure fans will sit closer to the action than any other stadium in the country. A 1,000-capacity ‘safe-standing’ area has been introduced for the first time in Australia for active football supporters. Additionally, with this stadium, Sydney joins a modern but growing trend for football-specific stadium designs that create more space for passionate fans to jump and move around without fear of serious injury or damage to fixed seating. 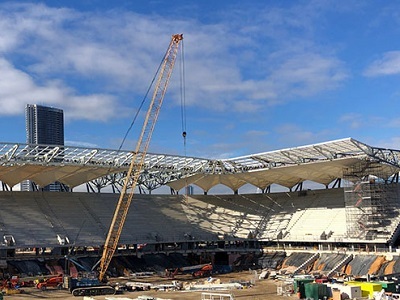 Cemintel has supplied approximately 5,000 square metres of the BareStone façade system for the cladding and soffit areas of the new Parramatta stadium. A pre-finished façade offering an authentic modern finish with its raw concrete look, Cemintel BareStone is recommended for both commercial and residential applications. Similar to the Cemintel ExpressWall system, BareStone assures both ease of installation and performance. The BareStone façade system consists of 9mm compressed panels coated in Cemintel’s unique CeminSeal technology to prevent water from penetrating into the panels, says Antoine Veling, NSW commercial sales manager. Cemintel has also provided Populous and NSW Infrastructure an appropriate maintenance regime to ensure the BareStone façade would meet the stadium’s 50-year design life. Full scale trial installations overseen by Veling with assistance from Cemintel Marketing, DesignLink and Rondo Building Services, were conducted at the project site to address the performance and service criteria for wind loads, corrosivity, anti-graffiti and impact resistance prior to acceptance of the cladding system for the project. The stadium’s façade installation is being executed by longstanding CSR customer, Brighton Australia.